Cariahuariazo is a volcanic peak in Ecuador, lying not far from Chimborazo. From the summit there are great views of Cotopaxi and Chimborazo. The summit bock of Carihuariazo at dawn, photo courtesy of Dominic Goodwin. 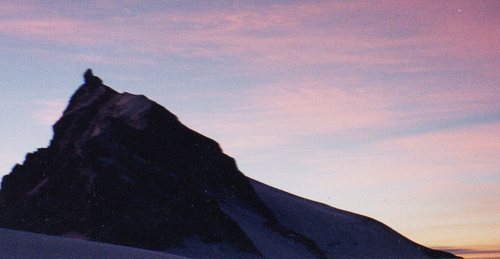 There is a lot less now and ice on this peak now, although the photo only dates from 1999. For details of how to climb Carihuariazo and neighbouring peaks such as Cotopaxi and Chimborazo please see our guidebooks, which are available in English, Spanish, Polish and French editions, direct from us or from all good bookshops and mountaineering shops.